Mad Bombs is a new explosive puzzle platformer flash game from armorgames about, uh well - exploding targets using running and jumping bombs. In the game, you have a cannon but the cannon is broken and won't shoot far enough to hit zombie pirates. So you need the help of your living bombs to ignite their fuses and run towards the targets thus making them kaboom. 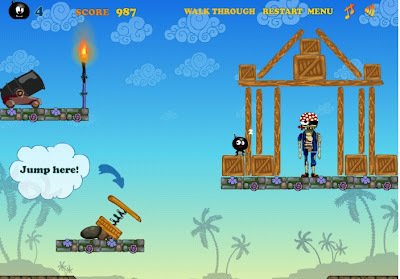 MB is quite and entertaining game and moderately hilarious. Nonetheless, it is fun to play and kill some time with. Anyways, if you need some strategy, guide, help, hints or tips, please check the official Mad Bombs walkthrough which shows how to beat all of its 20 levels.